Sculptor Thomas Doyle offers a profound, if morose, take on domestic life and interpersonal relationships by repurposing playthings into artwork that speaks. Using materials and miniatures originally used for the backdrop of model train sets, Doyle creates miniature dioramas enclosed eerily in airless bell jars. Otherwise soothing scenes of suburbia are rendered in seemingly post-apocalyptic states, with clapboard houses smashed, missing walls, or semi-consumed by a sinkhole no developer could have anticipated. Faceless, stone-like figures half-buried in foliage are juxtaposed with the frontlines of military conflicts enacted by toy soldiers whom, despite their plastic countenances, look convincingly world-weary. “My works aren’t post-apocalyptic, but there’s an anxiety triggered by that unrealized desire to transcend reality and enter those worlds,” Doyle told the Wall Street Journal. One poignant scene shows a home surrounded by a circle of destruction – shards of wood and presumably, the detritus of other eviscerated homes – with one lone survivor, a half-inch tall, lingering in the garden. Another shows the cross section of a living room torn asunder, a man standing before the fireplace with a dish towel over his shoulder as his wife turns away from him, suitcases in hand. Each enclosed art piece, measuring just 7 by 12 inches, must be viewed through a 2-inch piece of concave glass, which turns the diminutive scenes into endless vistas with no way out. 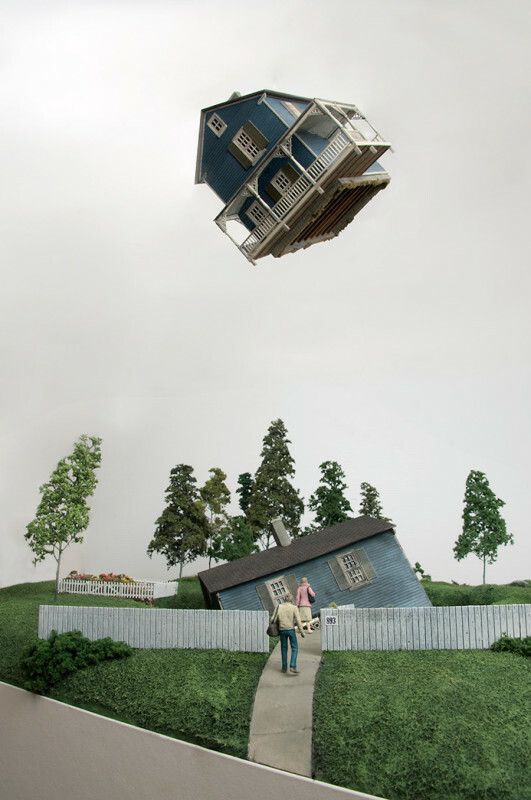 The tiny scenes are wrought from wood, wire, foam, styrene and papier-mache, and some critics have inferred references to America’s housing crisis, but Doyle insists on a muse much closer to home – frayed relationships, debt, anxiety. “I don’t have a very rosy view of the future and I suppose that telegraphs quite clearly through my work,” Doyle told Fast Company in an interview. The dioramas were displayed recently in the Dream No Small Dream exhibition at London’s Ronchini Gallery as part of a group show of miniature art. His work also appeared in a Thames & Hudson book titled Big Art/Small Art, published in late 2014. 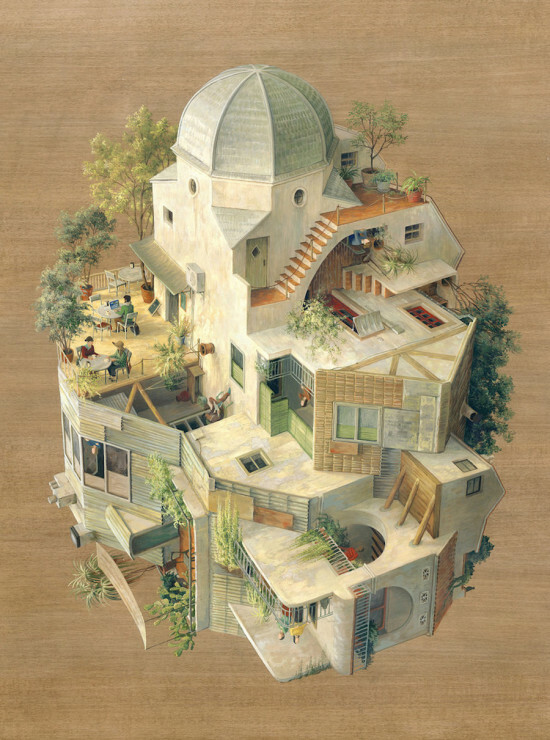 The impossible architecture depicted in paintings by Spanish artist Cinta Vidal Agulló are immersive M.C. Escher-meets-Dr. Seuss dreamscapes of multi-dimensional planes inhabited by tiny, doll-like figures. The “un-gravity constructions,” as Vidal Agulló calls them, are microscopically-detailed, small-stroke acrylic paintings on wood panels, each maze-like world resembling a planet unto itself. The confusion of the eye in its scramble to identify which way is up is a metaphor for the human condition: the impossibility of completely understanding those around us while grappling to comprehend ourselves. Namely, it is the oft-concealed disparity between our mental state and our physical environs. 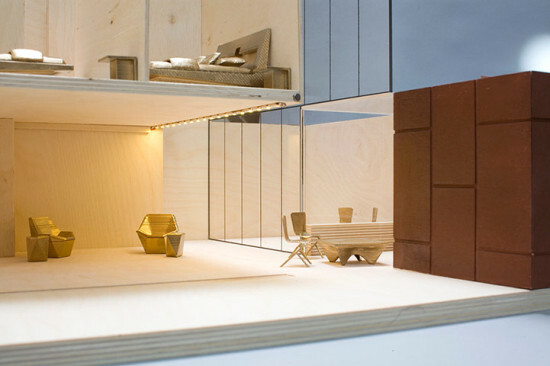 The topsy-turvy living spaces are peopled by faceless, solitary-looking characters and infinitesimal dollhouse-like furniture and objects, sometimes careening through the air. This foray into intricately detailed, realist painting is a first for Vidal Agulló, who has painted theater backdrops for operas for one of the world’s most prestigious scenography ateliers since age 16. She now works in a small studio in Cardedeu, a small town near Barcelona, Spain. Versed in the application of a large, broom-like brush and large-scale works, Vidal Agulló relished the challenge of reverting to a smaller scale where every flick of the brush matters. Her paintings feature multiple angles and top-sides of interconnected scenes where one is left to decipher the relationships between them. 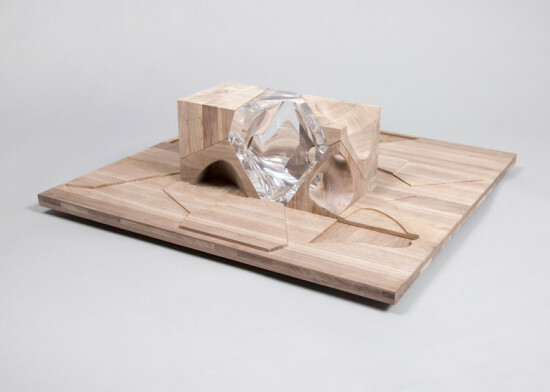 “The architectural spaces and day-to-day objects are an expression of how difficult it is to fit everything that shapes our daily space: relationships, work, ambitions, and dreams,” Vidal Agulló said in an interview with Hi-Fructose. Some of her paintings feature unnaturally conjoined buildings, while others depict upside-down-right-side-up interiors. “Playing with everyday objects and spaces placed in different ways to express that many times the inner dimension of each one of us does not match the mental structures of those around us,” she said.